Chandy sought financial support from NRIs in tackling the increasing cases of “cancer” in his state. 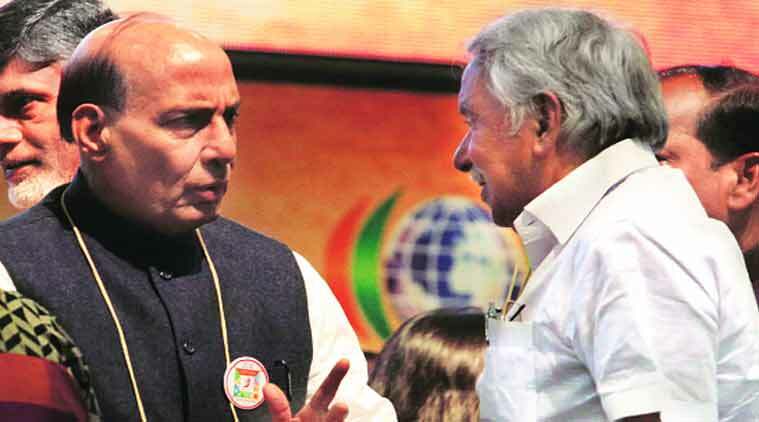 Kerala Chief Minister Oommen Chandy, who was the lone leader from the Congress-ruled states, on Friday emphasised on “no politics” in events like the Pravasi Bharatiya Divas (PBD). He was in Gandhinagar to represent his state on the last day of the three-day event. Chandy also sought financial support from the NRIs in tackling the increasing incidence of “cancer” in his state. “We are concerned about the welfare of the Pravasis. Every year, Kerala is represented in the PBD. Kerala has a lot of interest in Pravasi’s matters and so we not only take part, but take active participation,” said Chandy on the sidelines of a parallel session on Kerala where he addressed the concerns of NRIs from the state. When asked if there will be a political fallout within his party with regard to his presence at the PBD which was largely attended by CMs of NDA ruled states, Chandy replied in the negative. “No… nothing. There will be no such thing,” he remarked. Earlier, one of the bureaucrats from the Kerala government told the NRIs that though Kerala is doing well on health parameters like infant and maternal mortality rates, it is seeing an increase in occurrence of cancer where the state is clocking 35,000-40,000 new cases every year. “The state is seeing 35,000-40,000 new cases of cancer every year. The state already has huge population of about 2.8 lakh people who are suffering from cancers of different types. This is something very shocking and intimidating,” said Dr K Ellangovan, Secretary of Department of Health and Family Welfare, Kerala Government, adding that his government has started a “free” medical treatment programme for all cancer patients in the state. “This is the first time in India, probably in the world, where a government has taken a bold initiative to say that if you are a cancer patient we will take care of you. We have just started the process… We need assistance from people like you. Very soon we will be talking to you and writing to you for donation. You will be helping your brother in Kerala to tide over the crisis,” Ellangovan said. Meanwhile, in the special CMs session moderated by Rajnath Singh on Friday, Chandy raised the issue of “exorbitant airfares” being paid by NRIs from Kerala while travelling to and from Gulf Countries. “From the next PBD onwards, there should be a special one-day session for immigrant labourers to discuss their problems,” Chandy said.